Story In first sight, the new law is a very good and social. But maybe it is only symbolic? Coverage A protest demonstration on the beach in Tel Aviv in order to protect the beaches from the expected construction plans. Coverage What makes us eat animals in clean conscience? For the march participants the answer is clear: Education and the creation of a faulty consciousness. Coverage Before the opening of the World Climate Conference in Paris, on 27/11, marches were held in call for leaders to encourage the use of green energy. Story Following the decision of the government to promote the gas deal, we went to ask the citizens on the street - Who owns the natural gas? Talk Mr. Lenny Siegel and Mr. Doug Weir in a panel at the round table on chemical weapons and toxic remnants of war. November 10th 2014, Tel Aviv. Studio Land confiscation and the Palestinian struggle. “Protective Edge”- debates and discussions. Worldwide marches over climate change. Pride Parade in Jerusalem. Coverage Hundreds of thousands around the world marched on 28/9, demanding to switch to clean energy. The march held in 166 countries simultaneously, including Israel. Story do we really know what's in the food or how it was made? Recently, a discussion was held in the Knesset on whether to label products as 'genetically modified'. Story The Interior Minister ordered the removal of Eco organizations and civil society from the Urban Planning subcommittees, They gathered to discuss the order. 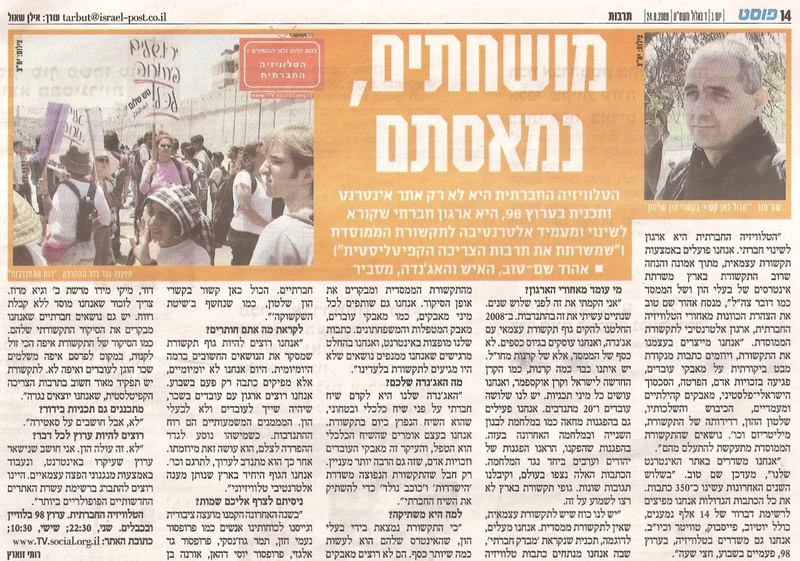 Story Residents of Emek Hefer are conducting a persistent fight against a state initiative to build a gas refining facility near their homes.